Patients who have suffered from a deep joint infection and other life-threatening complications after surgery involving Bair Hugger Therapy have filed lawsuits against the manufacturer of the device, 3M. 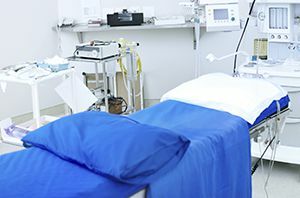 Some doctors have concerns about using Bair Hugger warming blankets because of a higher risk of contamination during surgeries. Patients who were diagnosed with serious infections following joint replacement surgery that involved the use of this therapy should contact our firm immediately. Our lawyers are handling potential lawsuits on a contingency fee basis, which means you will not pay any fees unless we receive a settlement on your behalf. Dedicated to justice, the personal injury attorneys at Goldberg Weisman & Cairo will fight for you. At Goldberg, Weisman & Cairo, we work for you. If you are an injured victim of a forced air warming blanket, it is wise to seek free legal advice in a consultation. In addition to having someone to talk to, knowing your attorney is litigating for you may ease your mind and stress levels. If you or someone you know has been injured by a Bair Hugger warming blanket, contact the law firm of Goldberg, Weisman & Cairo today. Do not delay another minute. Experienced personal injury attorneys are waiting to speak with you about your claim. It is estimated that hospitals have treated more than 180 million people since the device came on the market in 1988. However, multiple studies have found that forced-air warming carries a high risk of contamination at surgical sites. A Bair Hugger warming system or forced air warming blanket (FAW) works by circulating warm air through a hose into a blanket that covers the patient. The blankets, which are often used during hip and knee replacement surgeries, use pressure points to keep surgical patients warm by regulating body temperature. Operating rooms have a specially designed air-flow system which pushes cool air down and draws it away through return air inlets. This is designed specifically to keep bacteria or contaminants out of the surgical field. Studies indicate that the Bair Hugger forced air warming blanket may disrupt these airflow systems, substantially increasing the number of particles over the surgical site. Dr. Scott Augustine, an anesthesiologist, is the inventor of Bair Hugger. In 1988, it was FDA approved the same year it came out. In 2010, Augustine announced that his warming blanket was dangerous. Because air can recirculate and pull contaminants off the surgical floor and deposit them into sterile sites, patients in surgery may be at risk for deep joint infections. It is important to contact your doctor immediately if you notice any of the above infection signs and receive treatment right away.